Ultrasorbs™ AP Premium Drypad: 24"x36" ULTRA PAD / 70 pads per case Air- permeable drypads feature a patented SuperCore® absorbent that draws in moisture, locks it away from the skin and feels dry to the touch in just minutes. This pad is safe to use with alternating pressure and low air loss mattress systems and promotes air flow keeping the patient dry. The AquaShield film provides leakage protection that means fewer linen changes, no double-padding needed. Patented SuperCore® absorbent draws in moisture, locks it away from the skin and feels dry to the touch in just minutes. 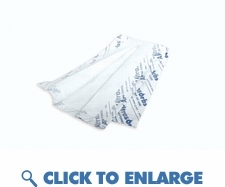 This special incontinence ultra sorb pad is designed for use with medical mattresses and help to promote healing and bed sore prevention. Air- permeable drypads feature a patented SuperCore® absorbent that draws in moisture, locks it away from the skin and feels dry to the touch in just minutes. This pad is safe to use with alternating pressure and low air loss mattress systems and promotes air flow keeping the patient dry. The AquaShield film provides leakage protection that means fewer linen changes, no double-padding needed. Patented SuperCore® absorbent draws in moisture, locks it away from the skin and feels dry to the touch in just minutes. This special incontinence ultra sorb pad is designed for use with medical mattresses and help to promote healing and bed sore prevention. Protects against leakage that leads to multiple linen and underpad changes. High-strength design reduces the need for multiple drawsheets for positioning. One Ultrasorbs does the job of up to 4 regular underpads. Compatible with low-air-loss mattresses used to prevent pressure ulcers. Effective for use with low-air-loss mattress therapy— protects the bedding and permits airflow.